1 How to check Robi 1GB Internet 9 TK Offer 2018 Eligibility? Robi 1GB 9 TK Internet Offer 2018! Hello Dear, welcome to Robi 1GB Internet 9 Taka Offer. The Bangladeshi 2nd biggest and most popular telecommunication company brings a special offer for their selected customers, whose name is Robi 1 GB 9 TK Offer. All the Robi prepaid selected connection users are eligible to enjoy Robi 1GB Internet at only 9 TK Offer. Under this offer, customers get 1GB Internet for 24 hours for 7 days. If you are a Robi customers and want to enjoy Robi 1GB 9TK internet offer 2018? Just follow the below content. How to check Robi 1GB Internet 9 TK Offer 2018 Eligibility? There is no way to check the Robi 1GB 9 Taka Internet offer. 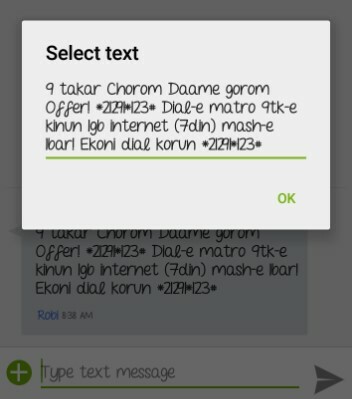 If you get an SMS like as the below picture, then you eligible to buy Robi 1GB Internet 9 Taka offer. To activate the Robi 1GB @ 9 TK Offer, Eligible customers need to dial USSD code *21291*123#. Customers can activate the Robi 1GB Internet 9 Taka Offer 2018 maximum 3 times. The validity of Robi 1 GB Internet Offer 7 Days. To check the remaining balance of Robi 9 Taka 1GB Internet Offer 2018? Just dial USSD code *8444*88#. Thanks for staying with us a long time and visiting Robi 1GB 9 TK Internet Offer 2018 content. If you have any question about the Robi 1GB 9 Taka Offer? Just comment here. We reply as soon as possible.